Any slot machine fans want to admit liking James Cameron’s 1997 quasi-historical epic Titanic? If so, you’re in luck: Big-name casino game producers Bally Tech have produced an exciting game with all the early-20th century glamor and romance, but without those pesky icebergs to steal the show. 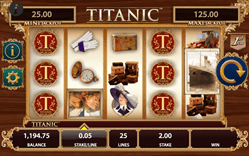 Does the Titanic slot reproduce the film well? Pretty well! Among the character set are our romantic couple as well as some of the film’s other players. Also included are symbols like luggage (soon destined for icy Atlantic depths), a pocket watch (used to check the time one last time) and ladies’ gloves (which will assuredly be useless when the ice water hits). The nostalgic player is also treated to jack Dawson’s famous “I’m the king of the world!” sound bit as will as a few bars from – oh, you bet it’s in here – Celine Dion’s theme song, “My Heart Will Go On” after big wins. What’s unique about the Titanic slots game? The multiplicity of bonuses, plus the unique way of awarding bonus rewards based on wager. Here’s how it works: First you’ll decided how much you want to wager across the Titanic slot’s 25 paylines.At 1¢, you’ll be “buying” a “3rd class ticket.” This wagering level allows the player access to the “Wheel” and “Mystery” features after hitting the correct symbol combination. If you’re playing for 2¢ to 4¢ per line, it’s a “2nd class ticket” for you, mate. This allows access to any number of “Mystery Jackpots” available in various pick ‘em games, which usually award coinage, a bonus multiplier and a quick refrain of “My heeeaaaarrrrrrrrt will go on…” against a backdrop of clanging coinage. Two personal progressive jackpots are also available for the winning in second class. Finally, if you want to travel with the DeWitts, Bukaters and Molly Browns of the world, you be looking at a “1st class ticket,” which will run you from 5¢ to $2.50 per payline. Naturally, the upper crust gets access to all possible bonus and can play for all three levels of progressive jackpot. Also of note: The top jackpot of 100,000x the payline stake is available only in first class. You bet. In the Titanic slots game, yet another reward comes in the form of the “Mystery Double Wilds Feature.” This bonus feature is randomly triggered after any spin in the base game and unleashes a heck of a lot of wilds. Three wild symbols (Rose, Rose & Jack and the Titanic itself) are already in play, but with this bonus activated, two to five “double wilds” will randomly be awarded; and these are held for another spin. Where can I find the Titanic slots game? 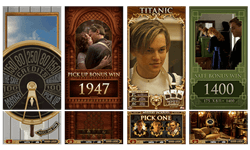 Thanks to the amazing amount of bonuses and high payouts possible, the Titanic slots game is reaching for levels of popularity the film saw in the 1990s. Many online casinos carry this title, including those sites listed here on DemoSlotMachines.com.